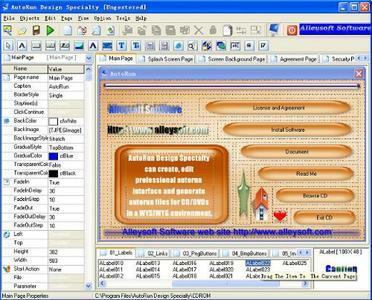 AutoRun Design Specialtyis a more powerful visual tool to create professional autorun (autoplay) interfaces and presentations for your CD/DVDs. It is the easiest way to create, edit professional autorun (autoplay) interface and generate autorun files for CD/DVDs in a WYSIWYG environment, just click, point, place and test (preview). So all is visual, fast, simple. AutoRun Design Specialty is easy to learn, with demos and wizards you can get started in just minutes! Main Page, Splash Screen, Screen Background, Agreement Form, Security Form, Exit Form and unlimited Sub Pages. Page Shadow, Page FadeIn and FadeOut, and many effects. 18 Objects: Button, BmpButton,PngButton, Image, Label, ALabel,ALinkLabel, Text, ScrollText, Memo, RichText, Browser, AVI, MediaPlayer, SlideShow, Edit, RadioButton and CheckBox. Page Template and Object Template make it more easy.